Inference as a service is seeing wide adoption in the cloud and in on-premise data centers. 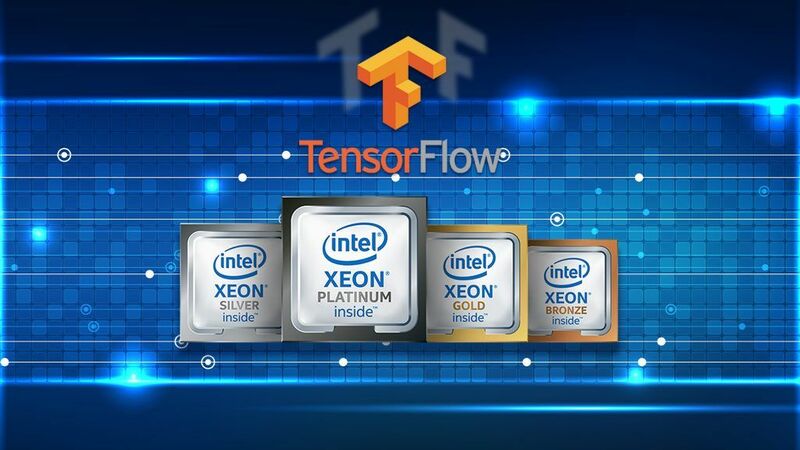 Accommodating various types of model servers like TensorFlow* Serving, OpenVINO™ Model Server or Seldon Core* in Kubernetes* is a great mechanism to achieve scalability and high-availability for such workloads. Nevertheless, the task of configuring the Kubernetes load balancer can be difficult. This article presents the most common challenges and recommended solutions. One of the differences between inference and well-known load distribution methods is that inference typically uses a gRPC* (Google Remote Procedure Call) API instead of REST (Representational State Transfer) API. gRPC has great advantages over REST because of its low latency and efficiency in data serialization. Inference workload distribution presents several challenges, including potential load balancer bottlenecks, the optimal configuration of session affinity to pods, and the security of traffic between clients and endpoints (including proper access control). Inference systems can be configured and deployed in a scalable manner. However, Kubernetes might not distribute the compute load in an optimal way. The reason is that gRPC, which is a common interface for inference requests, utilizes HTTP2 protocol, where every request is a stream inside the same TCP connection. For that reason, L3/L4 load balancers route all inference requests to a single target instance once the connection is established. A preferred solution is to employ a Kubernetes Ingress Controller which will perform the routing using L7 load balancing with full support for gRPC protocol. Our example below is based on nginx-ingress which we have tested and found to be reliable and secure for gRPC traffic. Below are examples of request distributions for two inference clients submitting a series of calls. In the first case, the clients connect via a Kubernetes Cluster IP assigned to the service with three nodes. 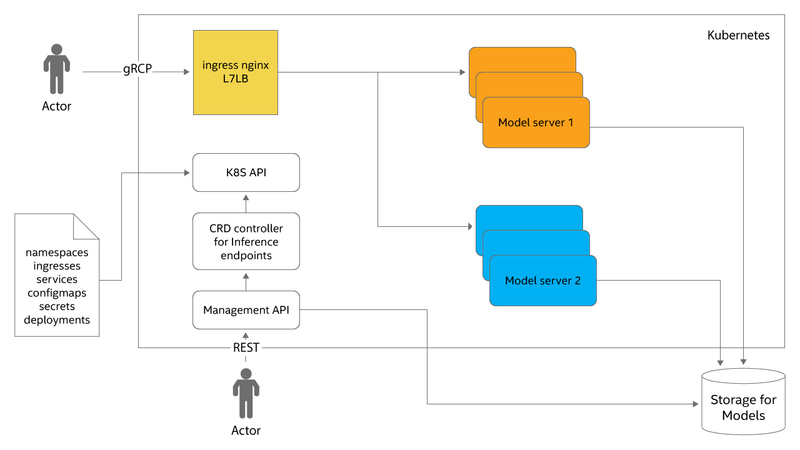 In the second case, the clients connect via a nginx ingress controller routing the traffic to the same Kubernetes service. Figure 1: Connection via Kubernetes* Service ClusterIP. Distribution of requests from two clients among three nodes. Colors represent clients. Test configuration in appendix. Figure 2: Connection via Ingress Controller. Distribution of requests from two clients on three nodes. Colors represent clients. Test configuration in appendix. Adding the L7 load balancer in the form of an ingress controller improves the distribution of the load on the whole cluster. As shown in the performance analysis below, it also adds a noticeable latency impact. However, it is still beneficial because it improves the overall capacity and system utilization and adds a layer of security due to added traffic encryption and authorization. Security is an important aspect of an inference system. It is necessary to address threats and protect user assets like inference endpoints that serve AI models, input user data and return inference results. Kubernetes cluster security requires user identity authentication, user permission authorization, and traffic encryption between the clients and the inference system to prevent ‘sniffing’ of transferred data. Traffic encryption is fairly easy to implement on the ingress controller side using TLS termination. User authentication and authorization can be client certificate-based or employed via a JSON Web Token (JWT) based mechanism. Here, the first option will be presented based on Mutual Transport Layer Security (mTLS) authentication. It is convenient to control access to inference endpoints for the applications, automation scripts, and other microservices. With mTLS, the inference endpoint encrypts the traffic using the server certificate. The inference request also includes an embedded client TLS certificate for authentication purposes. 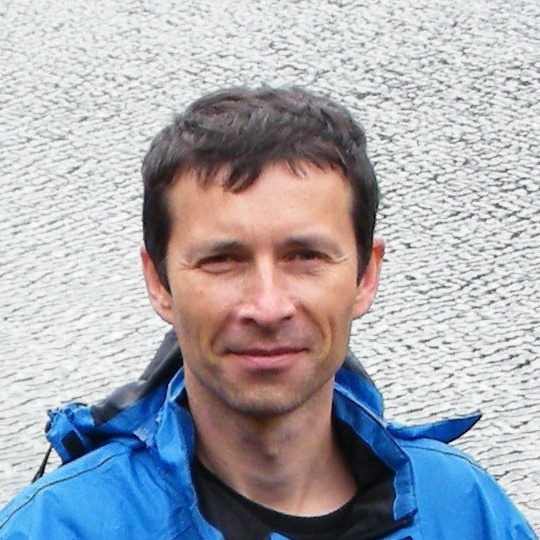 Bi-directional trust for the certificates is needed between the client and the server to establish a secure connection. More details can be found in our whitepaper. One of the proven options for implementing mTLS is to use an ingress nginx controller. During the tests, the gRPC client was hosted on a pod in the same Kubernetes cluster as the model servers, which were serving ResNet v1.50 topology. Kubernetes infrastructure was set up in Google Cloud GKE service. The tests were done on an Intel® Xeon® Scalable processor-based system with 16 virtual cores and 32GB of RAM. The gRPC client sent sequential requests to inference endpoints to calculate response time statistics. The client was located inside the cluster in the same local network. Figure 3: Model Server Processing and Transfer Overhead by Interface, Resnet v1 50 model. Test configuration in appendix. In summary, adding an L7 load balancer with TLS connection termination impacts latency and increases the workload on the client side. The latency impact is proportional to the volume of data passed to the server. On the other hand, the L7 load balancer adds critical security features and efficient load distribution across all service instances. As shown in the following tests, it does not reduce the overall CPU capacity of the inference system. The conclusion is that connectivity over inference service cluster IP should be used when the clients are located inside the cluster, even if the distribution of inference requests is not critical, and there is no need to encrypt the traffic on internal interfaces. In all other cases, connecting via ingress controller interface is the recommended technique for exposing the inference model servers. During the tests, the inference service hosted on Kubernetes with model servers received workloads from multiple parallel clients in proportion to the overall capacity, each sending sequential requests over the gRPC interface. Captured statistics are related to the average latency and throughput with a variable number of backend instances. 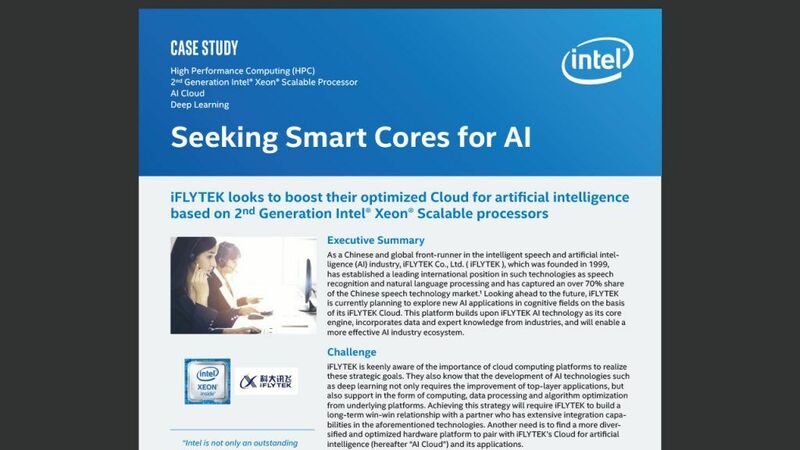 Each instance of the service was represented as a pod with constrained and isolated CPU capacity of four virtual cores of an Intel Xeon Scalable processor hosted in a Google Cloud environment. The hosting Kubernetes nodes had a total of 64GB RAM with 32 virtual CPU cores. 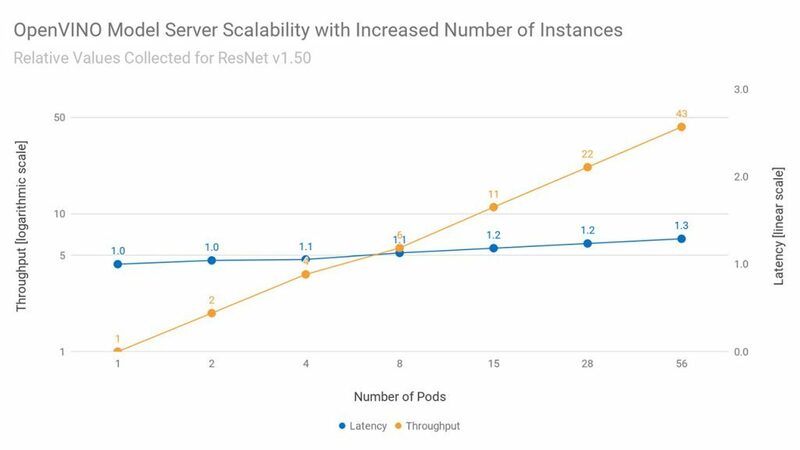 Figure 4: OpenVINO Model Server Scalability with Increased Number of Instances, Relative Values Collected for ResNet v1.50. Test configuration in appendix. To summarize the results of our testing, inference services can be enabled in Kubernetes in a highly scalable and secure way. It can be used to flexibly serve a large number of models for many clients and requests. Capacity can be scaled linearly both by adding pods in a single node and by adding more physical nodes. 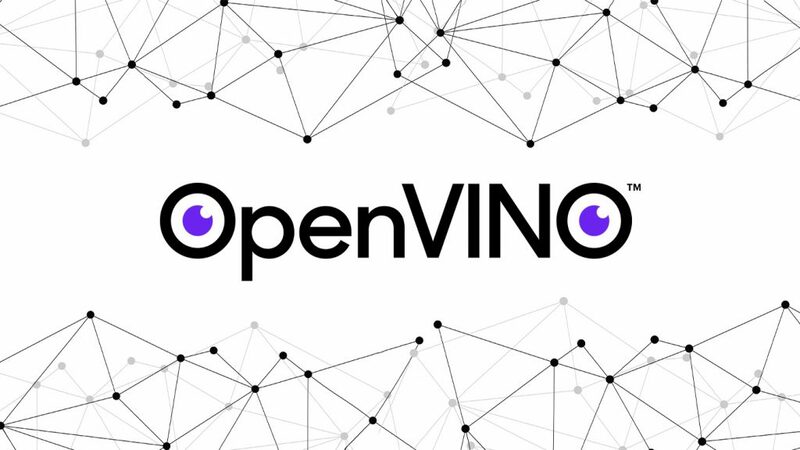 A variety of model servers like TensorFlow Serving and OpenVINO Model Server can be adopted in this way. Each model server has different strengths, so consider your frameworks, topologies, and usage pattern. It’s always best practice to test solutions individually. 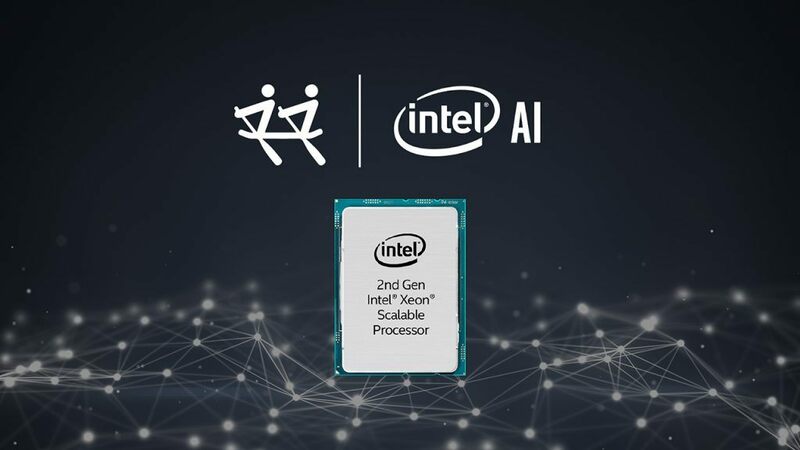 Intel recently released an open source component for Kubernetes, Inference Model Manager, which simplifies the process of configuring Kubernetes for inference endpoints. It enables an easy to follow REST API for managing and controlling the endpoints in a multi-tenant environment using OID (OpenID) token-based authentication. Each of the models deployed on the platform is represented by an inference endpoint CRD (Custom Resource Definition) and hosted as a model server instance (TensorFlow Server or OpenVINO Model Server) embedded within a Kubernetes deployment. The gRPC API exposed by the model server instance will be accessible externally over the ingress load balancer. During initialization, the model server instance downloads the model it is configured with from the appropriate storage bucket. Inference endpoints are grouped by tenants which represent teams of users. All inference endpoints created for a tenant are hosted in the same Kubernetes namespace that also groups other resources pertaining to that tenant. The REST management API exposed by the platform uses the same token and RBAC (Role Based Access Control) rules for authentication and authorization as the Kubernetes API. The REST API is for convenience and management simplification. A complete platform state is stored in the Kubernetes records. Minio, an open source storage server with an Amazon S3-compatible API, is used for model storage. All user interactions with Minio can be implemented via management API only. Management API acts as a proxy for filtering the traffic based on user token validity and scope. You can learn more about the Inference Model Manager component here and check out our extended documentation on this project for more details. For the latest technical updates from our team, follow us on @IntelAIDev. Performance results are based on internal testing done on 27th November 2018 and may not reflect all publicly available security updates. No product can be absolutely secure. Test configuration: Google Kubernetes Engine service using nodes equipped with Intel Xeon Processors of variable cores, capacity, and RAM allocation.